A MEDICAL centre on the outskirts of Longford town was daubed with anti-abortion graffiti overnight. The graffiti was daubed on the front entrance to a Longford town GP's clinic. 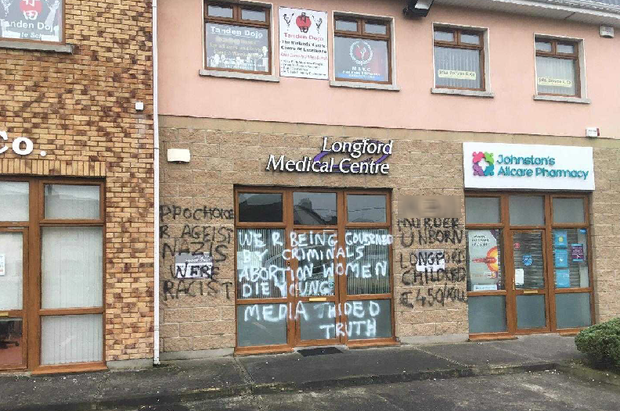 Anti-abortion activists are believed to have been behind the incident at Longford Medical Centre and the offices of a long-serving general practitioner. The offices at Leader House, just off the main Dublin Road, remained open for business this morning. Gardai are understood to be investigating the incident. Paul Higgins This is the Belfast glamour model who fell asleep at the wheel and caused a three-car rush hour pile-up on a busy dual carriageway. Allison Bray Trinity College researchers have discovered two previously unknown bird species that may shed light on the evolutionary process. Kevin Doyle There has been no contact between the White House and officials in Dublin about a possible visit to Ireland by US President Donald Trump this summer.